The land of 10,000 lakes will soon be flying through the skies on Sun Country Airlines. It is no secret that Sun Country Airlines is known as Minnesota’s hometown airline. From the locally sourced food and drinks to naming their planes after Minnesota lakes, Sun Country has taken hometown to a whole new level. Sun Country recently unveiled their first plane with the new look and I think it looks marvelous. 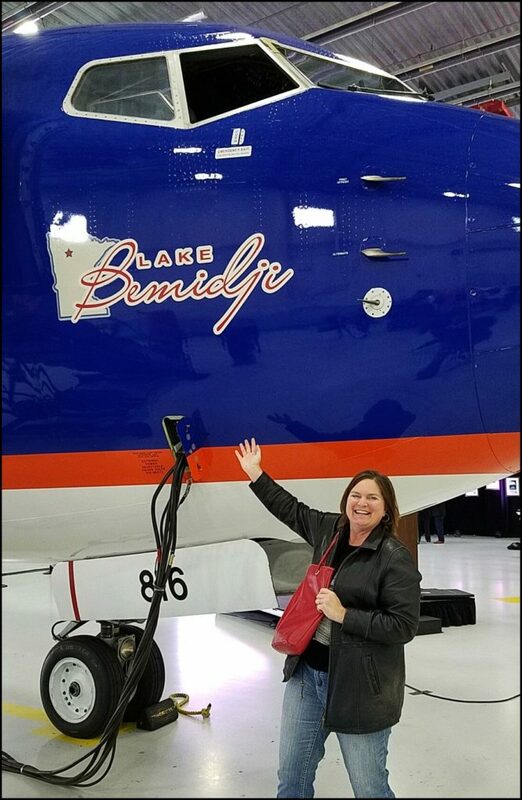 Can you imagine having a seat on this plane that is proudly named Lake Bemidji? With 25 lakes featured, there’s sure to be a plane that is host to your favorite Minnesota Lake. For visitors traveling to Minnesota from other areas of the country, including Mexico and the Caribbean, they may be introduced to their next midwest destination vacation. I can guarantee you, that travelers will be inspired to experience a new lake along their travels. I look forward to boarding a Sun Country plane in the near future, with one of these in view during flight. Here’s a little run down of what you can expect, in regards to the lakes when flying Sun Country. Each lake name will appear outside the plane on both the sides of the cockpit. 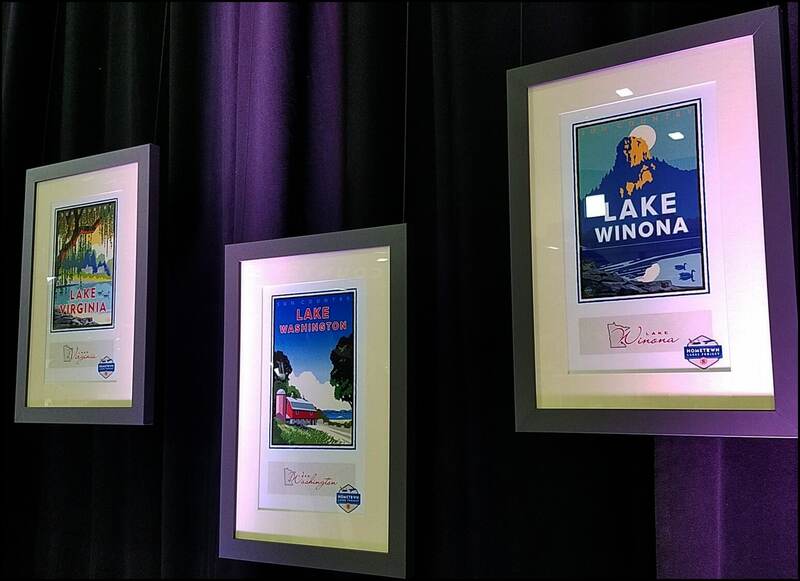 Minneapolis artist Mark Herman designed a unique piece of artwork for each lake that will appear in two places inside the cabin. Customers will be greeted during its preflight announcements with the plane’s lake name. Lake Washington really caught my eye, as there was a barn featured in this beautiful piece of artwork. Each lake features something special that gives the lake its claim to fame. The front and back of the plane will also showcase the lake that each plane is named after. I appreciated the fact that there were 25 lakes chosen from all across the Land of 10,000 Lakes. The following lakes will be featured: Bemidji, Como, Geneva, George, Harriet, Hiawatha, Hubert, Independence, Irving, Jefferson, Mille Lacs, Minnetonka, Minnewashta, Nokomis, Pepin, Phalen, Ripley, Superior, Washington, Vermillion, Virginia and Winona, along with Lake of the Clouds, Lake of the Isles and Lake of the Woods. Do you have a favorite Minnesota lake? 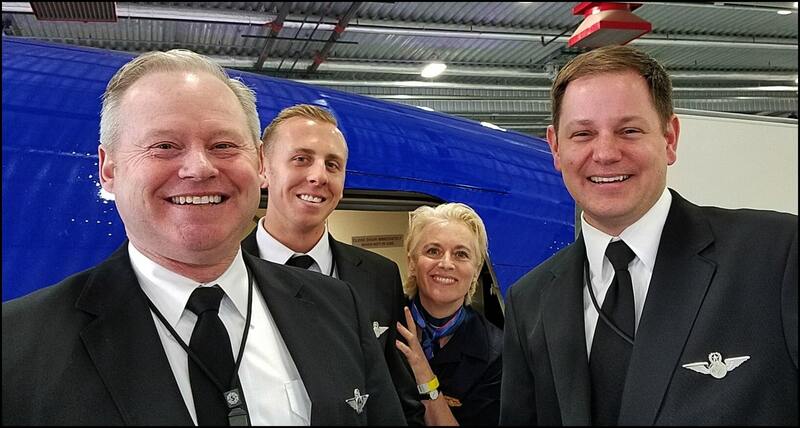 The crew on board Sun Country Airlines has always been top notched when I have flown out of Terminal 2 at the Minneapolis St. Paul International Airport. What’s not to love about these smiles? The Minneapolis St. Paul International Airport is my International home airport. Anytime I can fly out of Terminal 2, I’m there. With recent technology upgrades throughout the terminal, it’s quickly becoming a favorite of mind. Thank you Sun Country for being at the gate when I’m ready to fly. I’m ready to board and looking forward to flying the skies with you, as I help you share several of your 10,000 lakes with the world. Fun fact: Before I headed out the door to attend this event today, I came across a boarding pass on Sun Country from one year ago this week. *Thank you Sun Country Airlines for inviting me to see the unveiling of this beautiful artwork. 11 Responses to "Minnesota Lakes Are Taking To The Skies With Sun Country Airlines"
And again, you learn something new every day! Brilliant idea. Hopefully one day we can make it to Minnesota from the Caribbean and visit as much lakes as we can. Would definitely love to travel on one of those airplanes especially with smiling members of staff. Good to know for when we’ll be traveling through America (hopefully this year)! The artwork made by Mark Herman looks very nice. Would love to see a picture of the whole plane. I lived and studied in Minnesota back in 2005. Living in Moorhead on the border with North Dakota was a great experience. I’d love to go back to the land of 10,000 lakes and explore once again. I had no idea that Minnesota even had its own online carrier! I only know about Alaska and Hawaii’s liners but this is really interesting! And I love that a personal touch of retro artwork connected to the carrier’s associated lake name will be featured aboard each aircraft. How cool! I would love to visit the Great Lakes one day. I’ll have to keep this in mind when I make it there. I’ve heard it’s a beautiful part of the country. Their planes hold 162 people. Those personal touches do matter. That is a great gesture to name the planes after the lakes. Really a great idea to promote the wonders of your hometown. Sounds like an airline with a personal touch, very much lacking in some other bigger airlines. How big are the planes in their fleet. Never have been to Minnesota, didn’t know is had that many lakes! Must ba an incredible place to go during summers for outdoors activities! The crew looks lovely!